THIS FAMILT IS NOW KNOWN AS HEMISCORPIIDAE! This family has previously been known as Ischnuridae Simon, 1879, but in ICZN. 2003, Opinion 2037 (cases 3120 and 3120a), the name has been changed to Liochelidae Fet & Bechly, 2001. The reason for this change is that the old name was in conflict with a Dragonfly (Odonata) subfamily name (Ischnurinae). More info in Bulletin of Zoological Nomenclature, 60(2): 159-161 (June 2003). In a major revision of higher scorpion systematics, Soleglad & Fet (2003) included the genera Habibella and Hemiscorpius (from the now abolished family Hemiscorpiidae) into Liochelidae. This family consists of 11 genera and 68 species [Updated 29.09.04], and inhabits all continents except North America. 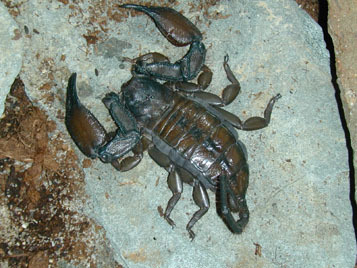 Liochelid scorpions are found in tropical and partly in subtropical habitats. Some of the scorpions in this family are quite common in captivity. In particular, the large and fascinating members of the genus Hadogenes are popular, but these are difficult to get due to limited numbers in the pet trade. Also some species of Iomachus and Opistacanthus have been reported in captivity. The scorpions in this family are not medically important (except Hemiscorpius), and some of the species have very high LD50 values. (High LD50 value means less venomous; e.g., Hadogenes troglodytes has a reported LD50 of 2,000 mg/kg (LD50 = Lethal Dose in 50% of samples, milligram venom/kilogram rat or mouse weight: Leiurus has an LD50 well below 1.00 mg/kg, for comparison)). Many of the members of this family have very slender caudas (tails, metasomas). 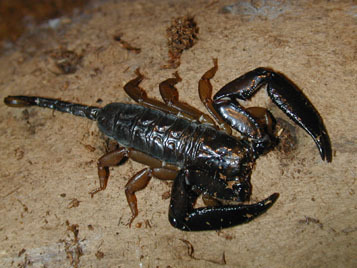 A characteristic of many members of family, especially, Hadogenes, is that the scorpions are very flat (looks like somebody has stomped on them). This is an adaption to a life in cracks and crevices. They resemble the scorpions in the family Scorpionidae, in which they were previously included. Some members of this family are very slow-growing, long lived, and can attain very long lengths (+ 20 cm). Iomachus politus photo (left) by Jan Ove Rein (C). Hadogenes troglodytes photo (right) by Jan Ove Rein (C).